Beautiful start to the morning with abundant sunshine across the state. 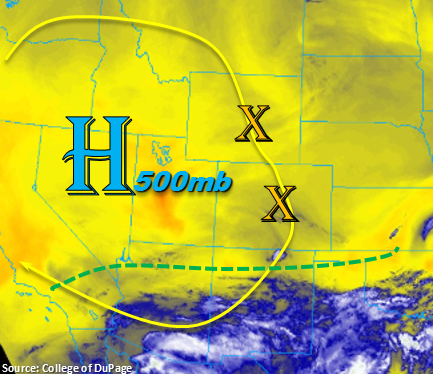 Today, the center of the 500mb high pressure will continue expand over the Great Basin bringing dry and hot conditions to the western US. 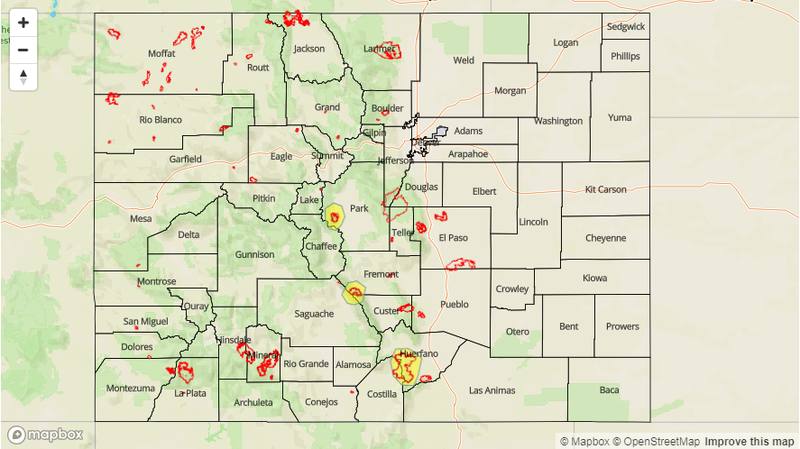 Colorado will remain under northerly flow aloft with a bit of an easterly component, which should keep the showers and thunderstorms this afternoon confined to the higher terrains. A couple shortwaves were noticed in the water vapor imagery this morning rotating around the high. These will help increase coverage of storms later today and may help fuel showers after the sundown. Subtropical is expected to remain south of the green line in the image below. Thus, widespread flooding is not anticipated, and dry low-levels will help limit rainfall rates. The shower and thunderstorm activity will kick off over the mountains around 1PM this afternoon. Highest totals by tomorrow morning will likely be along the east-west oriented ridges and along the Continental Divide. The activity today is expected to shift more to the west, in conjunction with the passing shortwaves, which will bring some much needed rainfall to the eastern San Juan and Central Mountains. A few showers may even track into the outer fringes of the San Luis Valley, which is well below average for this season. Guidance indicates some showers may linger over the eastern San Juans and Central Mountains through midnight, which would help put 24-hour totals near the 1 inch mark. To the east, storms are again likely over the southern Southeast Mountains, though there is a slight chance an isolated storm may form near the Palmer Ridge. With the entrainment of arid air into the low-levels, thunderstorms are expected to produce some gusty winds and dangerous cloud to ground lightning more than heavy rainfall. Max 1-hour rain rates up to 0.8 inches are possible, which would put burn scars at risk for mud flows, debris slides and flash flooding. A Low flood threat has been issued for the Hayden Pass, Weston Pass, and Spring Creek burn scars. Shower and thunderstorm activity should shift westward today. The strongest convection this afternoon will be along or near the Continental Divide and over the southern Southeast Mountains. Some showers might move into the outer fringes over the San Luis Valley as well. Max 1-hour rain rates up to 0.8 inches are possible along with gusty winds. By tomorrow morning, 24-hour totals up to 1 inch are possible over the eastern Central and San Juan Mountains favoring the east-west oriented ridges. A Low flood threat has been issued for the Hayden Pass, Weston Pass and Spring Creek burn scars. These rain rates have the potential to trigger mud flows, debris slides and localized flash flooding if a storm tracks over a recent burn scar. With the north and somewhat easterly flow aloft, showers and thunderstorms should be confined to the higher terrains this afternoon. This means plenty of sunshine and hot temperatures today. Most cities over the eastern plains will near the century mark. Further west along the Urban Corridor, temperatures will be closer to 90F. A few higher clouds may be found this afternoon near the Palmer Ridge area with some broken clouds over the far eastern plains. High temperatures will continue to run a few degrees above average for August. Dry air will keep the northern high terrains from receiving any measurable rainfall this afternoon. With the passing shortwave and mountain convection, broken cloud cover will be likely over the Grand Valley and Southwest Slope this afternoon and overnight. This may help keep low temperatures a couple of degrees higher than normal. Near surface smoke looks to decrease quite a bit as well with the exception of the far southwest corner of the state where the West Guard and Plateau fires continue to burn. Flooding is not expected.